is the theme at G.A. this week brought to us by the talented Kristin Long. I had such a hard time with this one, as I have a ton of favourite movies, most of them the golden oldies, and especially musicals. 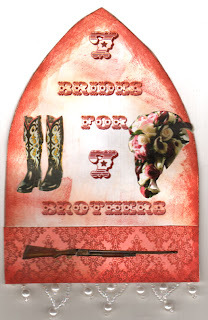 This is a tribute to 7 Brides for 7 Brothers, one movie I could watch, and have, for hours on end. I love Howard Keel, his voice is incredible, the music just grabs me and I'm a sucker for the dancing. I googled the title and got a bunch of You Tube links and I had to check them out. Some one has uploaded all the songs to the movie and some of the acting acts so I sat there for over an hour watching everything as my copy of the movie is VHS and it's in storage anyway. shoot! I'm going to have to look for all my fav movies on DVD, much more convenient. Please check below for a chance at some blog candy to help me celebrate the 2nd anniversary of my blog, which just past on the 19th. Great arch for this movie Mary-Beth!!! Great take on the theme Mary-Beth! Fab arch, a lot of fun, and you have caught the feel of one of my favourite movies. It is the dancing that I love, very ahead of its time, the sequence at the barn dance and the one with all the men singing "I'm as lonely as a hound dog". I am lucky I have it on DVD and t gets watched at least once a year. Love your arch and the movie. What a classic movie. I with Moria when it comes to the special parts of the movie. Now I have to buy the movie!!!! Wonderful pick for a movie i loved that movie too. Wonderful arch well thought about Way to go a real winner! I love it!! Love the color! And I think the distressing gives it a very nice touch! Oh my goodness. I used to LOVE this movie too...and watch it over and over. Your arch just captures the liveliness of it so beautifully. Thanks for making me think of this film again...need to go and rent it! This is so nice, I did also like that movie so much! And you made a really good looking arch to remember! Beautifully done! I love how you did this! I love the dangling pearls! I've never seen the movie, but I know it is an oldie and a goodie! Thank you for playing! I haven't seen the film for many years, but remember the song where the brothers are chopping wood - amazing choreography! But back to the plot: your arch is great. Just the right font too.